Sounds like a disgruntled AJAX evangelist. Flex is fifty years ahead of AJAX implementations. I agree that sometimes Flex can be overused, but it is one of the biggest steps forward in forever. 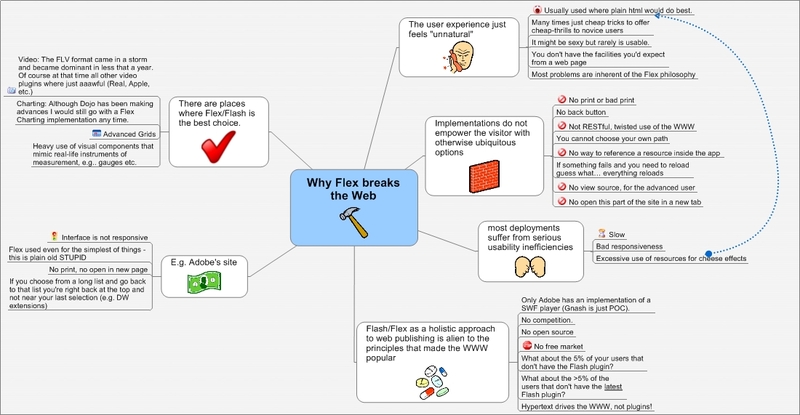 And “Flex breaks the web”??? For any HTML/CSS site I have to preview in 4 browsers just to be sure it works. Flex is the same on every browser. Sounds like HTML/CSS is broken to me. Not really… I would wish for a better Flex since it would solve many of my daily problems. It is a proprietary “ball of mud” trying to survive in an open source world. That is inherent of using various implementations (browsers) of a published standard (HTML/CSS). Everything moves towards that direction. Standards are goooood! Hmm, maybe I’m missing something here… the reason “Why Flex breaks the Web” is because “Too many people around evangelizing Flex… far too many”? I’m in Safari right now, and don’t always see pages as others do… was there something else to this essay that I missed…? Hi Jonh and thank you for your comment. I appreciate the feedback! "Hmm, maybe I’m missing something here… the reason ‘Why Flex breaks the Web’ is because ‘Too many people around evangelizing Flex… far too many’?" Well actually… yes! It’s a fact of life that the number of people talking about a subject is in inverse proportion to the percentage of people that actually have a clue about what they are talking (buzz-effect). You can see for yourself that most of the people out there talking about flex have never developed using it or are AJAX illiterate. It also shows how a big company like Adobe, having the necessary marketing resources, can influence/manipulate the market. "I’m in Safari right now, and don’t always see pages as others do"
First of all I would like to point out that you had a *choice*. Your OS gave you the choice to use the built-in browser or install Firefox or Opera or whatever is out there. One of the things I dislike on Flash GUIs is that they limit your choices when it comes to browsing/navigating, as I will explain further down. "Oh no, I see! I have to click a little JPEG to make it big enough to read, is that the way this works?" Yes John, when you click on a thumbnail it gets bigger. That is the expected behaviour of a thumbnail for the last decade (at least). What about "expected behaviour" in Flash GUIs..? "Is there any way I can copy the text in this JPEG essay, can it be searched,"
No since it is a "standard" mind map that I created for my convenience. Not all hypermedia are required to be searchable. Should I have any remorse if I publish a UML diagram in the future? On the other hand there is no reason at all for adobe to abuse flash/flex for the simplest GUIs. Why should I wrestle with the GUI every time I visit Dreamweaver Exchange..? "does it respect different device sizes"
If you have time I would suggest you to visit the " More about me…" page on this blog, to see that most of my academic publication are in the area of hypermedia multichannel access. Although this area was rising some years ago, the fact that the economic model that supports it is weak, has lead the whole movement to a standstill. With the above in mind and the fact that I use a free service like WordPress where I have limited access to the design elements of a page, it is obvious that the best I can do is design for the common fixed workstation. "what do you do for accessibility"
"and wait, let me try the browser’s Back button"
A: Flex makes a much better printable site that most Ajax. B: It’s not Flex’ fault that people misuse it. C: Flex is unusable for games and commercials, it’s a UI tool. D: The Flex SDK is open source. E: You clearly have no idea what Flex is. B: IMHO the Flex paradigm is innately wrong, as I explain in the mindmap. Besides that I must agree with you that there are several cases that people abuse it to the point that it becomes even worst. D: Please look again at the updated mindmap. Thanx for this controversial article on Flex. Among all those “Why Flex is so great” articles its a refreshing piece to read.